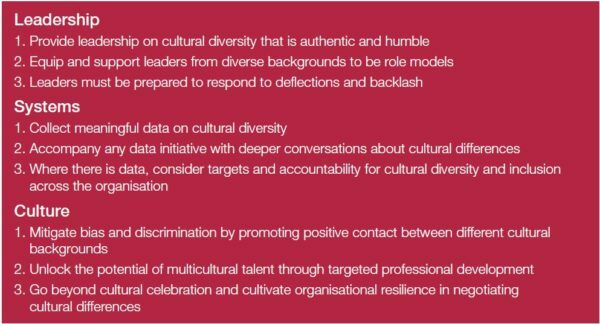 A useful and somewhat disturbing resource from the Australian Human Rights Commission, Leading for Change: A Blueprint for Cultural Diversity and Inclusive Leadership Revisited (2018) builds on the Leading for Change report released in 2016 to provide a snapshot of the cultural diversity at the senior leadership level of ASX200 companies and among our federal ministers, heads of federal and state government departments and vice-chancellors of universities. It examines the cultural background of 2490 of Australia’s most senior leaders. In other words, 95% of Australia’s senior leaders have Anglo-Celtic or European backgrounds, although around 24% of Australians are non-European. The report finds that cultural diversity is particularly low within government and university senior leadership. Things are even worse at the chief executive level – 97% of Australian chief executives have an Anglo-Celtic or European background. The report says ‘This is a dismal statistic for a society that prides itself on its multiculturalism.’ It suggests that changes must be made in three areas: leadership, systems and culture, and that Australia must improve its data collection systems in order to monitor cultural diversity within its organisations and institutions. Downloads in Word or pdf.